Tom Stoppard's "Rock 'N Roll" at A.C.T. 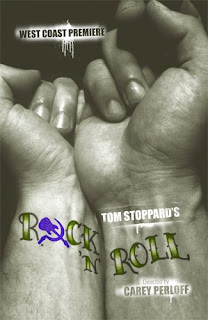 Tom Stoppard's latest play, "Rock 'N Roll" closes today at American Conservatory Theater in San Francisco. I attended the matinée performance on Wednesday, so my ears had to compete with the sound of candy rappers, coughing, belching, and the spirited older ladies behind me talking full voice in the false belief that they were whispering due to their use of artificial hearing booster devices. Keeping up with Stoppard's complex dialogue is difficult enough without having to decipher it through the geriatric sounds of the people sitting next to you. I did get most of it, however. Five Best Things about "Rock and Roll"
1. As is often the case at A.C.T., Reneé Augesen was a gem as Elanor. There is a scene it which Elanor breaks down emotionally because of her cancer and Augesen had me in tears. She is an actress who seems to take each and every roll she is given turning it into a masterpiece of individual stagecraft. 2. Act II. Act II was excellent. Once we started getting into the relationships in the second act and away from the exposition of Act I, the play becomes complex and compelling. 3. The humor. There are some hilarious moments in Stoppard's dialog that the actors delivered with perfect timing. They seemed to come out of nowhere which made the moments even more delicious. 4. Jack Willis. Like Augesen, Willis is a compelling force on stage. I didn't like some of the acting choices but it doesn't matter. He does everything with such conviction and power that any strange moments are immediately forgiven. For instance there was a moment in the second act where he loses his temper far beyond what the situation seemed to require. However he follows it up with a drive that justifies the prior awkwardness. That takes conviction and confidence as an actor. What I really admire about Willis and Augesen is that they are always so clear about the story and every thing they do on stage seems to always serve the story. Even though both actors posses loads of charisma, they never use that to personal advantage. The story is the thing.. the play is the thing.. and they focus all of their exceptional talents toward advancing the plot and making it as layered and rich as it can be. 5. Manoel Felciano as Jan, the central character. Despite some extremely mundane exposition in Act I, that I believe Stoppard should rewrite, Felciano did a wonderful job in this very layered and difficult roll. Did you see the show? Let's hear your opinion! That's it. Go see a play! I hope you got to see "Into the Woods" at Broadway by the Bay. 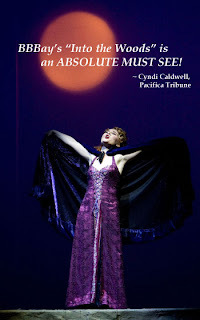 Stephen Sondheim's gem was very well done by the San Mateo company. Local regulars Paul Araquistain (The Baker), Linda Piccone (Jack's Motner) and Brittany Ogle(Rapunzel) were all fantastic. It was great to see Lee Ann Payne return to the Bay Area to play the roll of The Baker's Wife. She is an immense talent who I hope to see at larger venues like American Musical Theatre of San Jose soon. Sondheim is, I believe, the Shakespeare of our age. He has taken the American musical to the level of masterful poetry. I believe that in one hundred years his pieces will be considered the finest ever written and will be performed for centuries and decades to come. What do you think?